I recently posted a how to in 7E development and was not satisfied by my explaining and conclusions. So by trial and error I perfected my technik with a few cordless pones. Here goes nothing: read before doing! Read my first post, I am sorry I had to do it that way. Get the module stable and have good lightening (you need some kind of solder holder board or something) to get away from any surface. Then use a wide pair of tweezers to get a grip of the shield, or drill some holes ore just something in-between in the opening of the corners. 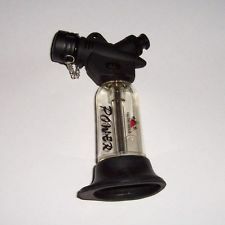 With the other hand light up your storm lighter (1300C). Heat it on top in slow circular movements. With the exhaust point of the outer blue bounder(approximately 6-9s) depending on soldier flux and of course heat. You can use flux around the sides of the shield. Suddenly it will just release, then lift it of in a confident move. Depending on your iron this is different. I will talk about how I did this low 18w. Probably would be better with 30 for this. Get your iron clean (water and new solder), leave some. Get a pair of tweezers ready, and grab the diode. Put your rod to the point(fresh and with some solder on it) this will melt the old solder, lift it or slide it of. When its removed there should be two small tin points. To shorten them put a small copper wire in between. Tin your preferred wire shorten it and grab it with your tweezers. Place it and lightly tin your rod. Let it touch the wire. DONT FORGET TO PUT THE SHIELD BACK ON THE MODULE! Clean module "or reuse the old solder. There is allot of it so I will use new" and solder the corners of the shield back on the module. I can do a vid If there is a need. Last edit: 16 Feb 2013 22:23 by Mullson. Did you solder the shield again? I am no hf specialist but I think this might be necessary. If you did: all around or only at a few points with your iron? Or with the heater like you have done for removing? My first shield is demolished so no shield on that one. I hope it's not a necessity. On my other Devo I can put it on if needed. If so I would do it with glue "polyurethane" in the corners. I tried to solder one back on and I wouldn't recommend doing it to something you need. Do you think its necessary to have it on? If so why? I would recommend putting the shield back on. 1) prevent unwanted radiation from the RF circuitry which could cause interference. the RF chips can radiate 2.4GHz radiation across the entire band (not the same as the output signals to the antenna), which could affect anything operating in the 2.4GHz band. The shield acts as a faraday-cage and must be electrically-connected to the board otherwise it will have no significant effect, so using hot-glue or any other non-conductive contact will not be sufficient. I think PB has put it very politely. BUT LET'S MAKE IT VERY CLEAR - YOU HAVE TO RE-SOLDER THE SHIELD BACK ON THE MODULE! Let us not make Deviation the target of our fellow enthusiasts or the law. Last edit: 16 Feb 2013 20:29 by RandMental. Thank you for the idea. I modified my 7e, great results, the out power increased by 10dB (10 times more). Here are the measurements before/after. I added a 10dB attenuator, so add 10dB to the value on the 2nd picture. Last edit: 19 Apr 2013 14:29 by mmormota. Did the diode mod. Thanks for the help. Here's some photos. Short the two points to complete the circuit. Blog post with the large photos. Feel free to use. Last edit: 25 Apr 2013 03:41 by Daryoon. 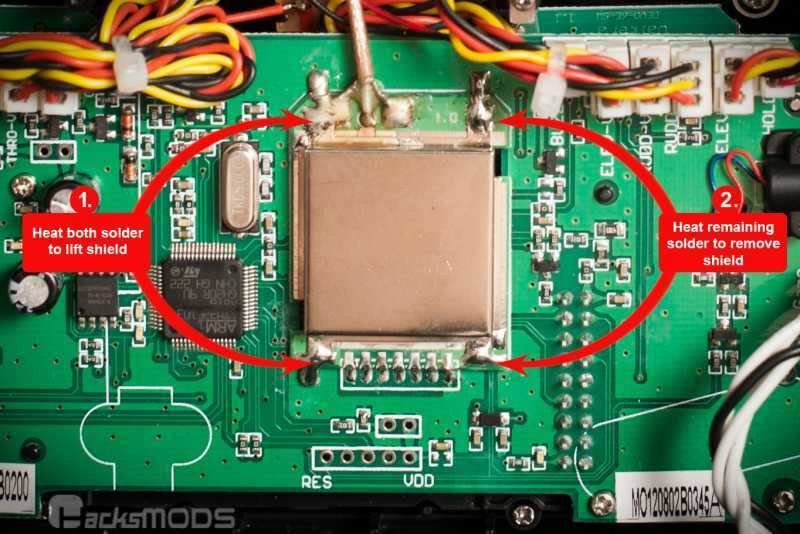 You appear to have only removed the diode; isn't it necessary for the mod to work to short it? 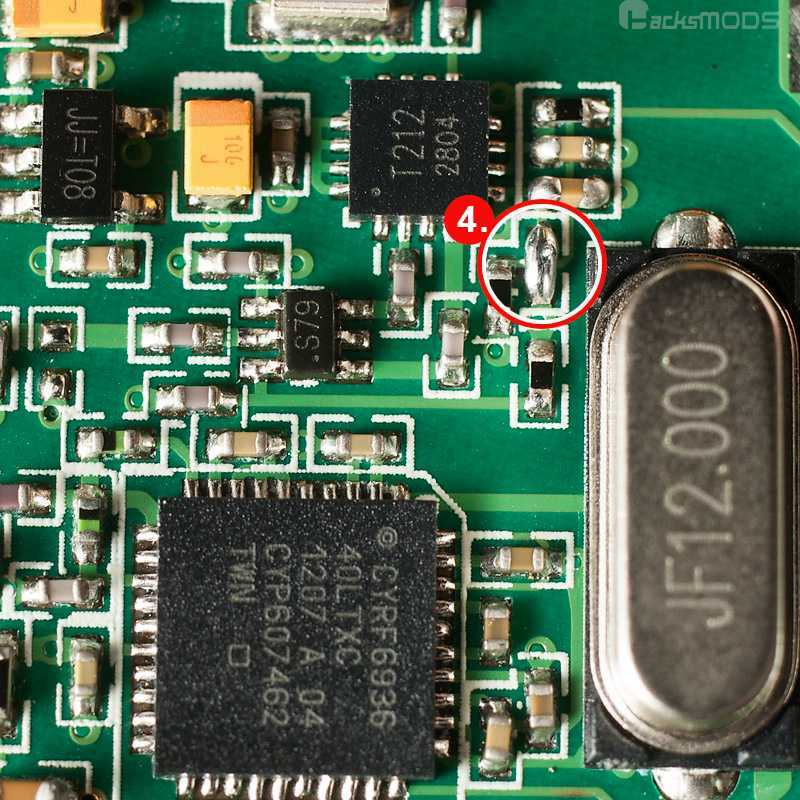 ie., either short the diode, or remove it and replace it with solder/wire? @Daryoon, yep - I think RoGuE_StreaK is right. You should short the diode. I have. Though, I don't have any way to test if the power has increased. You however can test if you have no power to the amp. Hmm , what is the value of the original diod ? And if you wanted say only a 100 to 200% increase in output , what would be a good replacement diod ? Pic 3 shows the diode removed, pic 4 shows the solder bridge. Last edit: 30 Apr 2013 18:53 by RandMental. old4570 wrote: Hmm , what is the value of the original diod ? To clarify RandMetal's point, this is an all or nothing thing. you can't use the diode to tune the power-output. with the diode the amp is off, with it shorted the amp is on; it isn't a volume control. The firmware is used to control the output power after applying the mod. If you use the stock firmware, you'll be transmitting at max power all the time, so don't do this if you are planning to go back to stock. 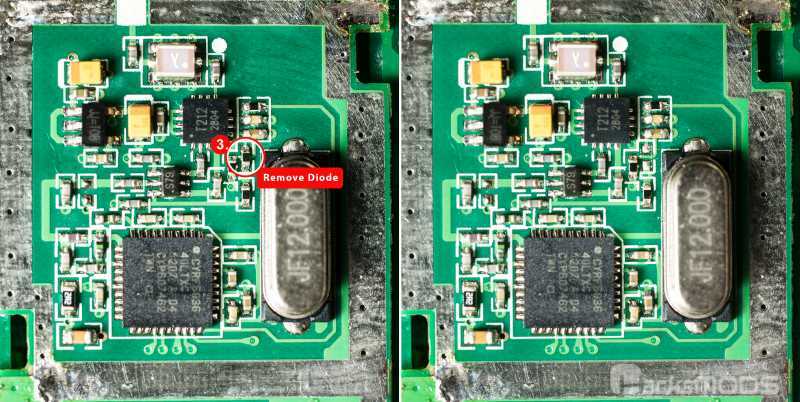 RandMental wrote: Pic 3 shows the diode removed, pic 4 shows the solder bridge. Just to clarify, pic4 didn't exist before, it has been added recently. Props to Daryoon for the update. Hmmm , so its all the way = Max Power + firmware change and then VIA firmware you can set output ? Has their been any experiments yet with antenna swaps ? Seems like the easiest option for a possible power ( range ) gain .. Yesterday I hacked my devo7E. It's awesome! Thanks for the great job PB!. But the only problem is the frequency range so I decide to remove diode. So please let me know how to edit tx.ini file. Can it be edited simply by using notepad or is there any extra method? old4570 wrote: Has their been any experiments yet with antenna swaps ? Seems like the easiest option for a possible power ( range ) gain ..
Search the forum, we had a number of discussion on antenna replacement and it can help a bit - an increase of times 1.5 to 2 maximum. Remember though that with x mW power going into the antenna, the only way to increase the radiated power is to focus it in specific directions. Simply put - what you gain in one direction you lose in other directions. Editing with a simple text editor is fine, but you shouldn't use notepad because line wrapping does not work correctly there. Use notepad++ or programmer's notepad instead (both freeware). Thank you for your kind reply. I already solve it. RandMental let me know notepad++. But you guys really kind people. Thanks a lot. 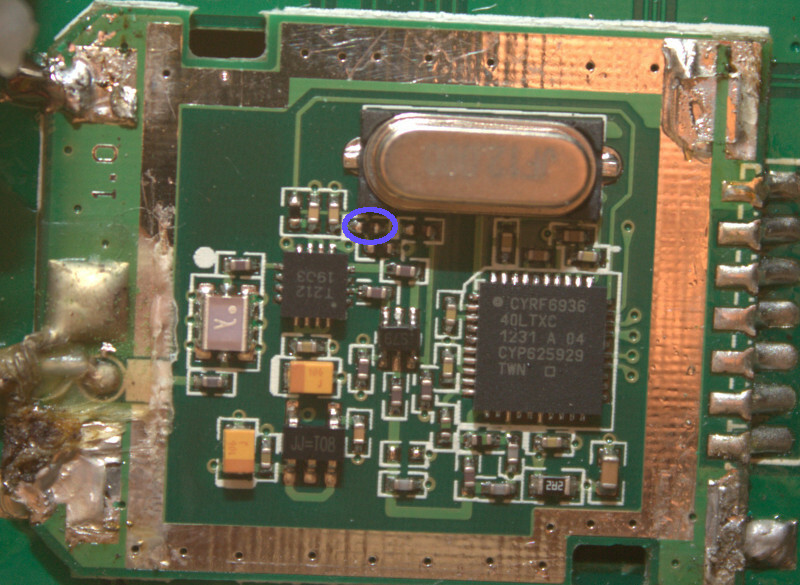 With my all thumbs soldering skill, I removed 4 diodes as the below picture. What can I do? Do I have to pay for another 7e or shorten 4 diodes? I need to look over the circuitry to figure out your options.